For STATES OF GRACE, we created an ongoing grassroots outreach campaign to medical, faith and LGBTQ communities to support a screenings campaign of over 150 screenings at conferences, medical schools, hospitals, places of worship, community groups and theaters. We also booked all speaking appearances by Dr. Dammann and the filmmakers. We secured a partnership grant to support an additional 50 screenings with the American Medical Women’s Association at medical conferences, schools and college campuses and are managing the screening & speaking tour along with AMWA. Winner of multiple audience awards, States of Grace intimately captures the profound transformation of a revered physician and her family in the wake of a life-changing accident. For Dr. Grace Dammann, a pioneering AIDS specialist who was honored by the Dalai Lama, a routine commute across the Golden Gate Bridge turned tragic when another driver crashed head on into her car. After seven weeks in a coma and a dozen surgeries, Grace miraculously awakened with her cognitive abilities intact, though her body was left shattered. 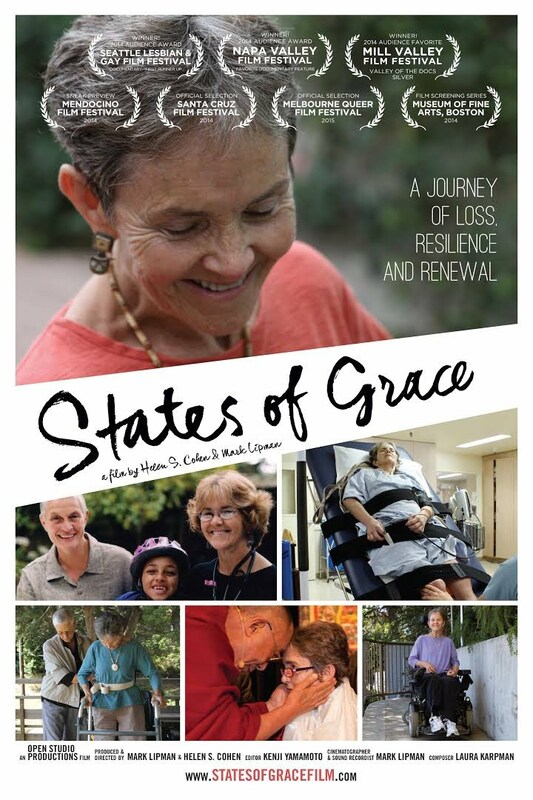 States of Grace follows her return home to the Buddhist community where she and her partner Nancy “Fu” Schroeder live with their teenage daughter Sabrina, who was born with cerebral palsy. Family dynamics are turned upside down as each of them must negotiate new roles and responsibilities. As the only able-bodied person in their household, Fu becomes the primary caregiver to Grace while also taking on a more active role as parent. Grace, meanwhile, must reconcile her joy at still being alive with the frustration of being so dependent on others. With dry humor and brave candor, the three of them slowly recalibrate their lives together and apart. Through verité footage and interviews with doctors, family, and friends, the film paints an inspiring portrait of devotion and trust as it delicately documents one woman’s fight to reinvent herself.